It’s announcement day! After almost 2 years of work, the cookbook is officially ready to go out into the world. Today I’m sharing ALL the details regarding the launch, but most importantly, what you can expect when you pick up a copy of My Little Michigan Kitchen. Launch Day: Tuesday, March 19, 2019. This is the day the book will be available to ship. Ladies Night at Peninsulas: Thursday, March 21st, 2019 from 6-9pm. STAY TUNED for an up-to-date list of shops where the book will be available. 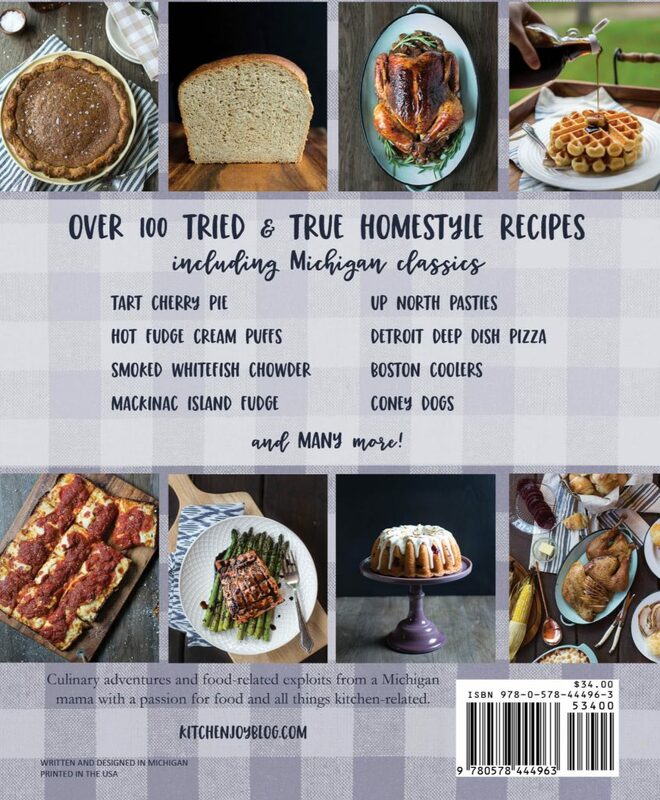 Over 100 tried-and-true homestyle recipes, including Michigan classics. Full color photography of nearly every recipe. Recommendations for Michigan beers and wines to use in the recipes. Information for where to purchase several Michigan ingredients online if you’re not local. 284 full color pages printed on 70lb premium paper. Stunning landscape photography and photos from life in Michigan. A poem, written by my husband as a child, about table manners, also because it’s fun. He may or may not have been required to write it due to poor behavior at the dinner table… Haha! Sketches and illustrations by yours truly. Several favorite food-related quotes, two antique Michigan recipes from 1876, a love story about meatballs, and SO MUCH MORE. Thank you all so much for visiting Kitchen Joy. I hope you’ll subscribe to receive notifications of new posts via email so we can keep in touch! I’m so excited that you’re here, and I’ve got lots of great new content planned. Have a fantastic and relaxing Sunday evening.